The popular adage “There’s no such thing as a free lunch” kept crossing my mind in the run-up to the just concluded London Conference on Somalia. I wondered why a gathering focusing on a Sub Saharan African country was to be hosted by the UK government in London, the Foreign and Commonwealth Office to be precise. I thought of keeping my musings to myself until I found that a number of people shared the same sentiments, especially my Kenyan friend Kenneth Ochieng who summed up these sentiments on his blog page which I have copied at the end of this post. Such a global gathering to discuss the way forward out of the litany of problems plaguing Somalia, referred to by policy makers and development experts as the archetypal “failed state” is certainly a commendable and progressive step. This is especially because Somalia’s problems of collapsed state institutions, Al-Shabab terrorism, piracy and humanitarian crisis affect not just Somalia but neighbouring countries such as Kenya and Ethiopia, and successfully tackling these problems requires a concerted transnational effort with the relevant stakeholders. However, my grouse here is why this gathering heavily attended by many African Heads of States, African multilateral organizations and other world leaders was hosted by British Prime Minister David Cameron in London? Understandably, the safety of dignitaries couldn’t be compromised by holding it in Somalia, thus I wondered why the confab couldn’t be hosted neither by Jonathan in Abuja or Attah Mills in Accra; nor Kibaki in Nairobi in the Horn of Africa within the vicinity of Somalia itself, nor Zuma in Johannesburg. The conference couldn’t convene in the brand new glitzy African Union Headquarters literally built from scratch and furnished by Chinese funds and labour. One could perhaps assume that a conference on the Nigerian Boko Haram insurgency group (probably the next biggest security threat in the region), would be held in some swanky conference hall in Washington D.C., New York, Berlin or Paris. I simply wonder when African leaders would grow up, be more assertive in handling African affairs and wean themselves off international help over every thing (apparently including having our regional headquarters built for free or confabs on African security held in far away European capitals). Yet at the slightest opportunity, when it suits our African leaders, they utter populist “pan-African” rhetoric about being “dictated-to” and constrained by “imperialist” Western nations. I wonder when we are ever going to grasp the dynamics of international politics and realize that nations hardly do things for others involving massive funds on the basis of pure altruism but mainly based on what would benefit them. When would we start put our own national interests on the front burner before taking any step, in this case seizing the opportunity of such an international gathering to showcase our beautiful capital cities and improve outsiders’ perceptions of Africa for instance, and cut costs associated with funding such international travels? With the conference over and a laudable communiqué released which inspires some hope on the future of security in Somalia, I hope our African leaders would subsequently consider being more assertive in holding such gatherings in an African country — even though the follow-up conference in June 2012 is billed to take place in Istanbul, Turkey. For one it would show our seriousness in taking charge of our destiny like other developing regions are doing and not painting the image of a helpless, dependent continent. For another it would boost the profile of the city holding such a gathering especially in the international media, and also bring in some foreign revenue to the local economy from hosting and accommodating delegates. OK listen AU, IGAD, EAC, NEPAD and all other multilateral African institutions and ‘statesmen’ who’ve perfected the art of perennially ranting and whining about ‘Western Imperialism’. I am talking as a Pan-Africanist disturbed by the ingenuity, ineptitude and slack of many a folk in the exclusive club of African leadership. 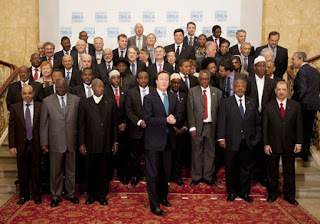 Listen, an intergovernmental, inter-agency summit is underway in London, United Kingdom as I write. It’s the Somalia Conference convened by British Prime Minister David Cameron and his allies to address the troubles and restoration of Somalia. I know you are probably there already – INVITED, and must have carried elaborate delegations with you. Invited to participate? Invited to provide quorum? Or maybe just to be placated? Maybe to be arm twisted like you traditionally have been. Don’t you find it uneasy, disturbing or just funny that you are invited by a foreign entity, the same ‘Western Imperialists’ that you detest so much to deliberate on an endemic African predicament, a shameful scar on the Emblem of Africanism that is squarely on your mandate? Aren’t you a tad bit disturbed by your always sluggish, last-man response to matters of African welfare? I listened pensively to presidential speeches at the recently concluded AU summit in Addis Ababa: African leaders whining, distraught and disenfranchised, faulting the West, NATO for their role in the destabilization of an African flagship country – Libya. But come to think of it, beyond that barrage of rhetoric, emotions and the display of flaring tempers orchestrated by the likes of Zimbabwean ‘statesman’ Robert Mugabe, What did you do about Libya? How much seriousness did you commit to standing with an African state? How much resources or even time did you devote to rescuing Libya? After how long did you act? Anyway, I guess my questions could be indeed irrelevant for a people who can’t even agree on a stable AU leadership, a people clearly disillusioned and oblivious of their mandate. How shameful it is that you just get invited to an assembly of this calibre. How humbling it is that you will merely sign the resolutions but without the muscle and space to take centre stage in their execution. How I wish this would have been a partnership at the least, a joint caucus of an African multilateral institution with the western allies OR at best an African initiative strategized and executed by Africans drawing in international allies. As it is, I guess you haven’t mustered any serious leverage in these deliberations and you won’t be able to bargain and argue more aptly for Somalia, the Horn of Africa, and Africa. God forbid you might be participating effectively as rubberstamp ink, in a premeditated process of ratifying already engineered English/Western judgements on the prospects for Somalia. Isn’t it time you cut the rhetoric and got more proactive, more strategic and more creative in sorting out the challenges bedevilling our beautiful troubled continent? Isn’t it time such big African economies like Nigeria, South Africa as well as promising ones like Ghana, Botswana rolled up their sleeves and contributed more in terms of resources, time and delved into the murky waters of African Unity like their counterparts in Asia, Europe and South America do? For as long as you proceed with the prevailing ambivalence about these imperatives, you continue to sell out Africa – Cut the rhetoric folks; get down to work!